Readers are booklovers and booklovers love libraries and bookstores. Some of us make it a point to visit well-known libraries and bookshops as we travel. 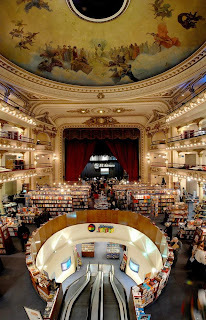 If I ever get to Buenos Aires, the El Ateneo bookstore pictured here will definitely be on my itinerary. It looks magnificent and practically worth the trip all by itself. Of the stores around the world featured here, the only one I have been to is Shakespeare & Co. in Paris. I understand that they've moved the shop now and I can well believe they had to. It was cozy and historical and in need of some repair. But whenever you've found this many books in one place, whether it be a library or bookshop, you've found a sanctuary. Enjoy.